Trying to finish off everything at work can be a daily battlefield. 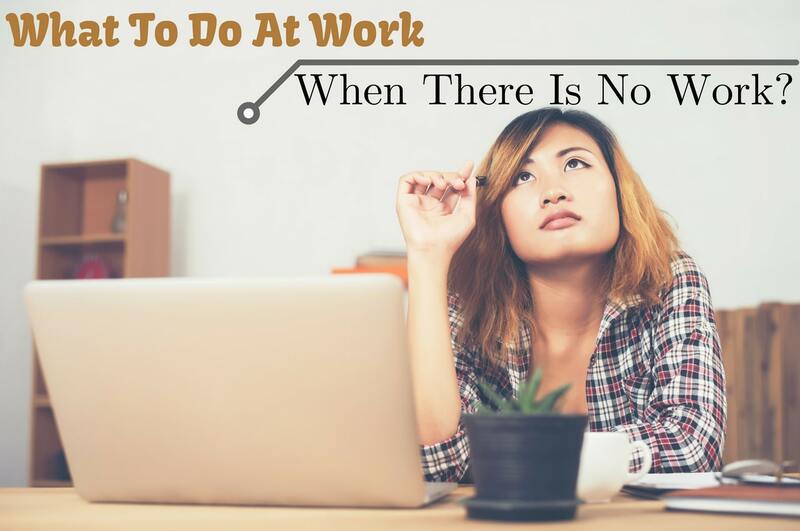 Most days, we are all just swamped with the amount of work we have to do. Sometimes, we even become over ambitious and take up too much on our plates. However, slow work days are still not extinct, and if you are reading this article, then maybe you are also experiencing a slow work day. Don’t brush it off and take this time out to catch up on your YouTube videos or even sneak in a little nap at work. It is important to bear in mind that even on a slow working day, you are still being paid for your time at the company. So, you can use this much needed break and utilize the time to catch up on quite a lot of other tasks. Your slow working day does not have to be a non-productive one. There are some things you can do at work when there is no work. When you’ve No Work? What to do at Work? Very often, employees feel overwhelmed when they suddenly hit a slow working day at the office. These days are spent going into a ‘low gear’, where you might spend your day doing other tasks such as cleaning out your desk, organizing your files which have been lying in a clutter all week, or even socializing with co-workers or friends outside of work. While this is not the worst thing in the world to spend your time on, there are certainly more ‘high gear’ tasks which you can concentrate upon on a slow working day. These tasks can include activities which can help you get one step closer to achieving your larger objectives at work. They can help you stay in good light in the eyes of your employers. While it is true that you should take breaks every once in a while to keep your mind sharp and your body healthy, here are some other tasks you can do on your slow working day. Believe it or not, some of the best tasks that are completed with success actually have a secret formula to it. This secret formula is something not many people know and believe in, but today you can put it to test. For any task to be successfully accomplished, you must remember the golden ratio of 80:20. Sounding a little vague to you? Don’t worry, we’ll explain it. You should ideally spend 80% of your time planning your work ahead, making a blueprint and a Plan Of Action. The rest 20% can be spent on the actual execution of the task. Without proper planning, you will be left overwhelmed during the actual task. Spend your slow working day planning out your tasks for the coming week or long term planning for your office. Visualise the growth path of your organisation for the coming years. This is called Proactive planning. This way, you will have a clear Plan of Action in your mind and be able to execute your tasks harmonically. By this, we don’t mean log on to social networking websites and spend your day stalking! Your office must be having several departments with many other staff members working together whom you might not be too familiar with. Maybe you are just on a first name basis, or you just share a smile and a nod every morning. Spend your slow working day getting to know people in your office. This can be a smart move for your career as this helps you stay in the front line of visibility amongst peers and seniors in your office. This can be vital for your career growth. Create a good reputation for yourself in your company and use your enhanced visibility to your advantage. Just because you are having a slow working day, does not mean your co-workers are as lucky. Go over to the next cubicle and lend a helping hand if anyone requires one. Help your colleagues with some of the simpler tasks. This will help you do something productive for the company, as well as allow you to have some time to bond with your colleague. Maybe you have stacked up a bunch of articles or books to read which can someday help you with your career. Today is finally the time to start reading! Pick up the books or head over to your company library and read up on something that you have been putting off for a long time. Here, we are talking about reading work related articles like articles on networking, leadership, and anything to do with professional development, and not Shakespeare! Take advantage of this slow working day and pick up a new skill which can help you for your work in the near future. For example, if you are working in IT, you can read some articles and learn up on the new trends on coding; or if you are working in a fashion company, you can spend the time researching on the latest fashion trends which are in, and how you can contribute with this information to your company. Most companies are associated with some sort of fundraiser even which can help the company with their PR as well as give them a chance to give back to society. If your company is involved with any of these support causes, this would be a good time for you to lend a helping hand to these support groups. Get involved with a charity event and spend some time giving back to the community. At the same time you can get a chance to build a better relationship with your co-workers and employers. This will also help create a positive image for you at your workplace. With the advent of technology and the internet, you can now attend classes without even having to get up from your seat and visit the location. Sign up for a webinar online and attend a virtual classroom. Upgrade your professional skills and create a lasting impression for yourself in your workplace. Most online webinars are free and allow you to increase knowledge on topics which might be helpful for you at work, such as digital marketing, web design, and other related topics. Since you are being paid for your time in the office, you should try to be productive and contribute towards your organisation even on your slow working day. Chalk out some ideas or thoughts you might have in mind for strategies for the betterment of the company. Go over to your managers office or simply send the documents over for them to read over. It could just happen that one of your ideas is brilliant and your manager would like to implement it right away! This would bring you into the good books of not only your manager but also your co-workers. There is a reason why the world is becoming more and more digitized as the days pass. Digitization allows you to store important documents in a safe, secured place, ensuring that they do not get lost in the crowd. They are also much easier to find when in a rush by using appropriate keywords. On your slow working day, take some time out to digitize your important documents. These could be your employment contracts, important passwords and ID’s, proof of work authorization, etc. Upload them on an online storage and safely file them away until you need them next. It will be much easier to find these documents the next time you are in a hurry. For some, this activity might sound like a complete waste of company’s time. However, if you really go into the depth of this, you will come to realize exactly how important this small activity can be for you. A messy desk is the sign of a messy mind. By decluttering your workspace, you will be able to clearly organize all of your important things in one place. Throw out those unimportant documents and scraps of paper which you have been hoarding. Make a clean, neat workspace for you to work and concentrate on. The activity itself of decluttering your messy workspace can be quite therapeutic, allowing you to put in your concentration on just this one work which ends up giving you very gratifying results. Completed all of your pending projects and now you find yourself just sitting and looking for something exciting to do? Why don’t you create a new project which will benefit the company? Talk to your boss about your idea and put it into action instead of just waiting for the right time to bring it up with your superiors. Now is the right time! So get started on your project and you might just cause a revolution at your workplace. Whether you admit it or not, all of us have a to-do list of small things at work which we have been putting off for a better time. These tasks just did not seem worthy enough to spend time over on a busy day, or maybe you just forgot and put it off till the last minute. Well, today is a lucky day! Bring out your to-do list and start checking the boxes as you complete one task after another. At the end of it all, you will find yourself having completed all of those small tasks (such as deleting old work emails you don’t need anymore, organizing your important files in order, eliminating distractions from your workspace, etc.). You will feel a great sense of relief after completing these tasks and will be able to start work with a fresh mind the next day. Every organization has important facts or data which are exchanged every single day. Maybe there are some important data or facts which you haven’t had the time to check up on till now. Take your time off and use it to study or memorize this important data. By the next meeting, you will be completely prepared and confident to take the lead and not feel lost with the facts and figures anymore! If it is a slow day for the entire office and not just for you, you are in luck. Spend your slow working day at the office speaking to your boss and superiors about the upcoming company goals, achievements and the strategies of the company to achieve them. This will give you a head start for the upcoming projects and also let your superiors know that you are actively interested in working hard to achieve the company goals. This will also keep you on the front line for when your superiors are planning on delegating the next big project to someone, or even help you with your next promotion! There is never a dearth of tasks to be done and responsibilities to be taken at an office. If you are having a particularly slow working day, speak to your boss about taking on some new responsibilities. Take some initiative. This will be a good boost for your career as well as kick away the boredom from your workplace. Slow working days are a rarity at any workplace, but if you are facing one of these slow days, put it to the best use! Use some of these tips and make sure that your slow working day turns into the most productive day for your company and your career!